The entities panel shows you a scene's entities in a hierarchy, starting with the scene itself. An entity can be a child of the scene or of another entity. 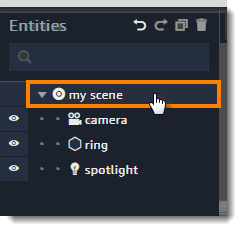 When you choose the scene in the entities panel, the inspector panel shows the scene's settings. When you choose an entity, the inspector panel shows the entity's components. Organize your entities by their physical or logical relationship to other entities. An entity's position, rotation, and scale are relative to its parent. When you move the parent, the child moves as well. To change an entity's parent, drag it onto the new parent in the entities panel. – Collapse the entity to hide its children in the entities panel. – Hide or show an entity in the canvas. – Undo or redo changes. Double click an entity's name to rename it. Double click the entity's icon to frame it in the canvas.